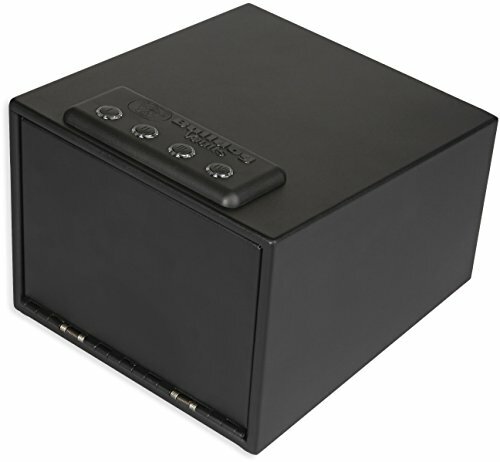 Our Magnum LED quick Vault with RFID access offers user friendly RFID options that allow entry by use of an access card or key fob. This 11.5 inches x 10 inches x 8 inches Vault features deluxe heavy-duty 16 gauge steel construction, removable steel shelf, and has an interior light. The deluxe egg crate style foam padding will protect your valuables or pistols. There are four methods of entry including LED, "night light" access buttons, RFID access card, RFID key fob, or with the 2 emergency keys. A separate power button ensures all four LED access buttons are backlit for accurate code entry. Our quick opening spring loaded door with quiet, "soft stop" technology allows for retrieval of your firearm without revealing location. Exterior Dimensions are 11.5" x 10" x 8"